Thanks to Sean for the explanation on how to install the bungee cords. I used cable ties to assist in keeping the bungee cords in position while bolting the end washers. TIP: Insert and secure the rubber support blocks into the frame as well as the centre pin before installing the bungee cords. 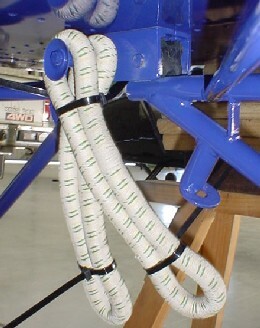 The cable ties makes the process easy if you are doing this as a one person operation. 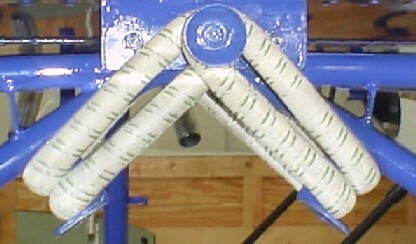 Cut the cable ties when the cords are in position and rig a block-n-tackle or comealong with the brace across the axel of the wheel. 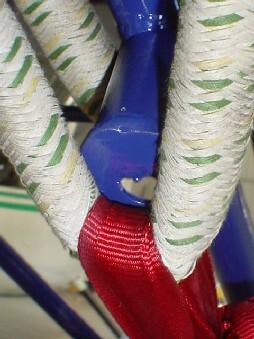 This will prevent damaging the paint as well giving you a solid point on which to tension the bungee cord. Hook one end of the bungee over the retaining washer and use the loose end to pull the cord into position. 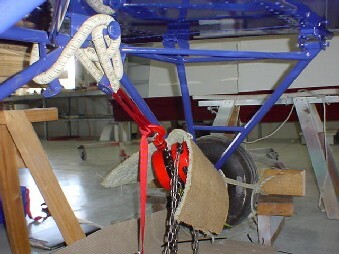 TIP: The carpet over the block-n-tackle is to protect the paint work from being scratched. 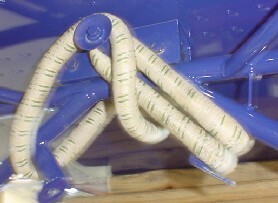 Use a nylon strap to wrap around the bungee cord as this will slide out from under the cord when it is in position. 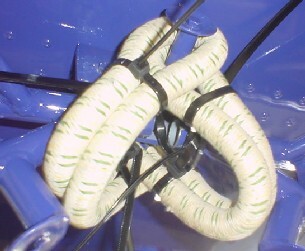 Pull the bungee cord over the retaining washer and it will slide into position without damaging the cord and the paint work. 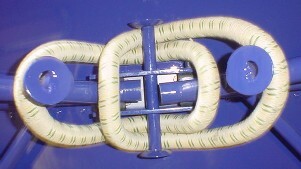 Release the tension and pull the nylon strap out from between the bungee cord and the steel retaining washer. Repeat the same steps for the opposite side.